Out of all the coverage of the recent gender war in the Senate Hearing Room, some images and words just won’t go away. Like the observation that women all over the country were reporting flashbacks to their own experiences with men in the workplace who didn’t have work on their minds. Ah yes. As a woman who’s been out there since pre-N.O.W. days, was I remembering incidents I hadn’t thought about in years? 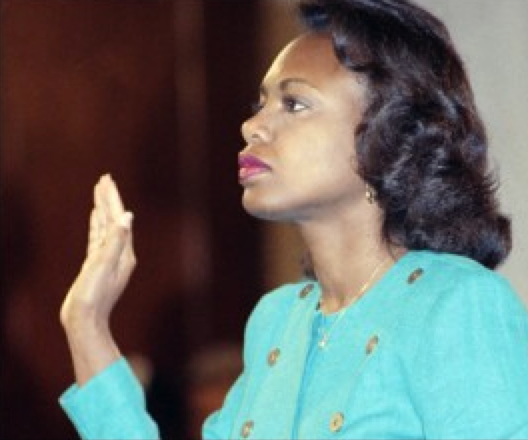 Did I identify with Anita Hill, and was I prejudiced on her behalf? Ah yes. I wonder how many women were suddenly thinking all the way back to our very first jobs, when the ever-so-nice daddies of the kids we babysat got scary when they drove us home. I’m remembering the department store, the college library, the radio station, the publishing houses, the federal agency, and the Capitol Hill office—and I realize that I had a system. When a man made an out-of-line move or remark, no Senators, I didn’t cry, yell, quit or complain. I made no response at all. I was cool, serious, work-focused and undistractable. I kept right on talking about the work at hand. And if he persisted, I’d ask him pleasant questions about his wife and kids. It worked—they gave up and got back to work. The lesser men involved did put it out that I was cold, ambitious, humorless, not a team player— sound familiar? But the wiser ones got my real message, that we could work together and be friends and nothing more. Some of them, Senators, are still friends. I call them and they me. They speak well of me and I of them. They’ve never tried to sink my career and I wouldn’t hesitate to drive them to an airport. I hope I helped them learn how to deal with women at work—I hope that they wouldn’t lewdly proposition an Anita Hill. But the men who would do that don’t have fangs. It was hard to know whether to laugh or throw things at the television set when Senators and witnesses said that a respected man in a responsible position would never do such things. I kept thinking of the scene in Casablanca, when Claude Rains declared himself “Shocked, shocked!” that there was gambling going on at Rick’s—as he pocketed his winnings. The news—and life—are full of men who are pillars of the community, the corporation, or even the church, and just lose it when it comes to dealing with their own sexuality. When I worked on Capitol Hill, it abounded with respected, famous men who were out-of-control lechers. You and I know that, the witnesses knew that, and the Senators knew that. We’ve got a long way to go on this one, and we’ll never get there if we pretend that only monsters talk dirty, and try to get women they work with into bed. Meanwhile, I think the country owes Anita Hill the old-fashioned courtesy of an apology for the stupidity and pretense that have been aimed at her. And from this working woman, Professor Hill, my apology that those of us who preceded you into the workplace haven’t managed to make it all that it should be. You deserve better.